"If you could 3-D print a circuit that manipulates photons instead of electrons, that could pave the way for future applications in light-based computing, that manipulate light instead of electricity so that devices can be faster and more energy efficient," Tan says. Tan's co-authors are graduate student Justin Beroz, assistant professor of mechanical engineering Mathias Kolle, and associate professor of mechanical engineering A. John Hart. "For the first time, we've shown that it's possible to build macroscale self-assembled colloidal materials, and we expect this technique can build any 3-D shape, and be applied to an incredible variety of materials," says Hart, the senior author of the paper. Beroz says that as the colloid solution is pushed through the needle, the liquid acts as a bridge, or mold, for the particles in the solution. The particles "rain down" through the liquid, forming a structure in the shape of the liquid stream. After the liquid evaporates, surface tension between the particles holds them in place, in an ordered configuration. As a first demonstration of their colloid printing technique, the team worked with solutions of polystyrene particles in water, and created centimeter-high towers and helices. Each of these structures contains 3 billion particles. In subsequent trials, they tested solutions containing different sizes of polystyrene particles and were able to print towers that reflected specific colors, depending on the individual particles' size. "By changing the size of these particles, you drastically change the color of the structure," Beroz says. "It's due to the way the particles are assembled, in this periodic, ordered way, and the interference of light as it interacts with particles at this scale. 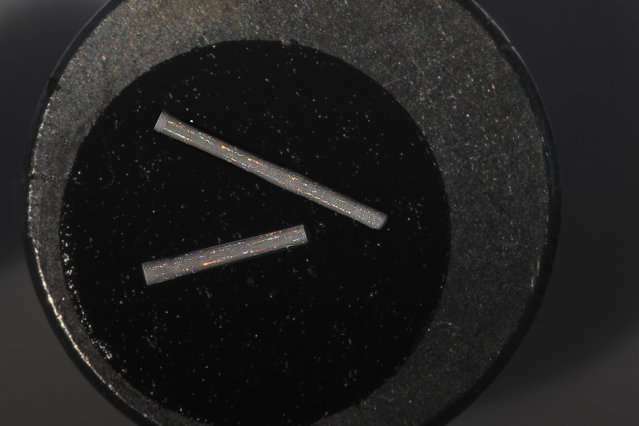 We're essentially 3-D-printing crystals."